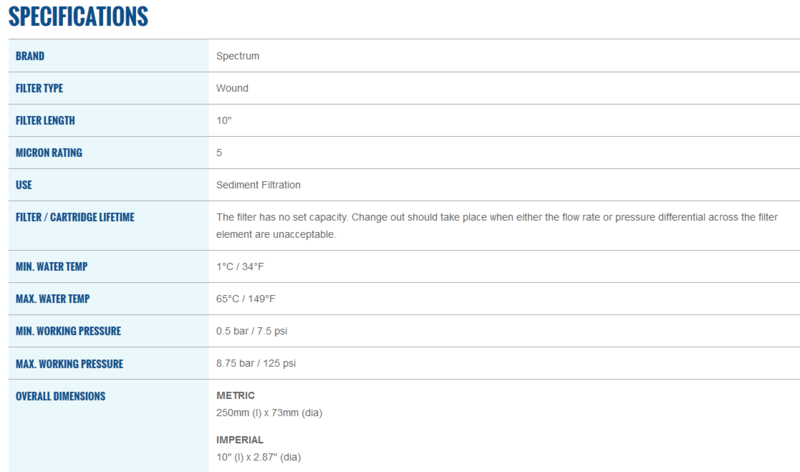 10", 5 micron wound polypropylene filter for dirt / sediment filtration. The wound structure of the filter gives more depth filtration than a spun or pleated filter as the winding of the material creates ridges and layers to the outer surface. Pre-filter for rainwater harvesting systems, well water filter, swimming pools, bore holes etc. Pleated cartridge can be washed down and reinserted into the housing to be used a number of times subject to water quality. Cartridge dimensions: Approx. 10" x 2.6"
Also available in different micron sizes. Please call us on 01704 531556 as we are likely to stock the micron rating you are looking for. We offer discount if filters are purchased in multiples as we are always looking to give discount to our customers where we can. Click the button below to add the Aqua Cure 10" Wound Polypropylene 5 Micron Sediment Filter Cartridge to your wish list.